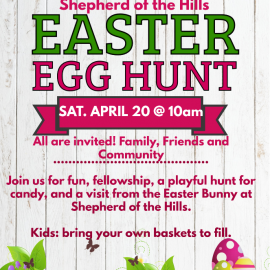 Join us for fun, fellowship and a playful hunt for candy. Special guest visit from the Easter Bunny. Please bring your own baskets for children to fill with goodies. All are welcome! All are welcome to join the annual fishing trip to Caroline Retreat Center in Fort Valley. 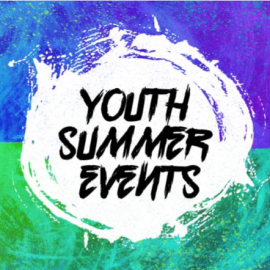 We leave church at 8:30 am, buy lunch at Subway in Front Royal, and fish until 3:00 pm. Fishing licenses are not required, fishing gear is available if you let Fred know in advance. Bait is purchased at the 7-11 Store, carpooling is available. 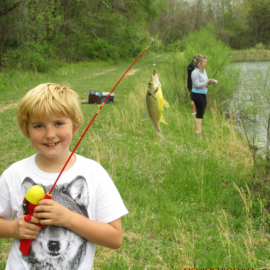 Bass, Crappie, and Sunfish can be caught. Contact Fred K. at fredkall@aol.com to sign up or for more information.